Da Capo Lifelong Books, 9780738214689, 272pp. Buy Green. Eat Green. Save Green. If you've wanted to eat like it matters but felt you couldn't afford it, Wildly Affordable Organic is for you. It's easy to think that "organic" is a code word for "expensive," but it doesn't have to be. With these ingenious cooking plans and healthy, satisfying recipes, Linda Watson reveals the incredible secret of how you can eat well every day--from blueberry pancakes for breakfast to peach pie for dessert--averaging less than two dollars a meal. Packed with tips for streamlining meals, from shopping and cooking to washing dishes, this book shows how sustainable living is within everyone's reach. Slow global warming with delicious dinners? Lose weight, save money, and save the polar bears at the same time? When you live the Wildly Affordable Organic way, it is possible! Join the movement to change the way you eat--and keep the change. Linda Watson, the founder of CookforGood.com, created her wildly affordable cooking plans after being inspired by a national challenge to eat on a food-stamp budget. She credits her background in project management helping her to not just survive but thrive on just a dollar a meal per person. Her 2013 SNAPcut Challenge used WAO recipes to cook organic and local even on the newly reduced food-stamp budget. Linda has a certificate in Plant-Based Nutrition from eCornell and the T. Colin Campbell Foundation. She's had a wildly varied career so far, including developing a top-secret expert system, working with Tom Clancy and Douglas Adams on computer games, and riding the dot-com wave with eGarden.com. Today she teaches cooking through classes, books, and videos. Watson lives in Raleigh, North Carolina, with her husband. In the first chapter, Linda describes her first shopping trip on a dollar-a-meal budget. What made it difficult? What would you have done differently? How has the way you shop and cook changed with your financial circumstances? The first night of her budget experiment, Linda uses a bread machine to make bread. What recipes did she develop to avoid using this appliance? Why? What appliances do you use regulary to make your cooking easier or more fun? Linda learned a lot about thrifty and delicious cooking from her mother-in-law who learned to cook from scratch while living on a farm during the Depression. What have you learned from your mother or other family members? How have cooking and family meals changed over the past few generations? Who is the biggest influence in your cooking style? How are you sharing your cooking skills with others? In the TED talk below about the origins of pleasure, Paul Bloom says that we are essentialists: our beliefs about the origins of objects change our perceptions of their value. He cites studies showing that kids will enjoy vegetables more if they think they come from McDonalds and that adults enjoy wine more if when they think it's expensive. Do you think that's true for you? What other indicators of value can you give foods so that thrifty meals are even more enjoyable? 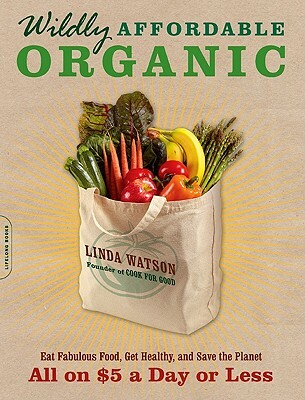 Wildly Affordable Organic has 100 recipes, but it also has shopping lists, menus, and cooking plans. What other organizational ideas did you find useful? What do you do to manage the whole cycle of feeding your family, from planning, shopping, and growing to cleaning and storage? One chapter is called "Something from Nothing." Would you try any of these techniques to squeeze more out of your food dollars? What tricks do you use that aren't in the book? Have the buy-local and organic movements changed the way you shop? How? What's more important, local or organic? The subtitle for Wildly Affordable Organic mentions "Get Healthy." What did you see in the book that would make you healthier? What could be adopted by your schools and organizations to make the population as a whole healthier? Another part of the subtitle says "Save the Planet." How can something as personal and simple as food choices help save the planet? What does it mean to "vote with your fork?" What are you voting for with yours? Does this book inspire you to try something new? Joel Berg of the New York City Coalition Against Hunger says that good community nutrition is like a stool with three legs: affordability, availability, and education. Are there areas in your community where people might have money for food but no access to healthy ingredients? Are there people who can get good food but don't have a place, equipment, or skills to cook? What can you do to improve this situation? Linda says "thrift enables luxury." What does she mean? If you do this yourself, what are some examples?